The Great Lakes are not really lakes. They are not the large ponds that most people envision. They are inland seas. They are freaking huge. Lake Superior itself contains 10 percent of the world’s fresh water. It is 350 miles across. Because of its north-south orientation, Lake Michigan is greatly affected by winds that blow across North America. Think of it like a big bowl of water. Put a fan on the west side of the bowl. Waves kick up toward the east. But then what? To seek its level, water starts sloshing back to the west. Winds can turn around and blow from the east with great velocity, too. So Lake Michigan gets pretty high surf: 10, 15, even 20-foot waves. Now think of sheets of water that freeze on top of the Lake. Then think of very high winds (which we had just previous to the polar vortex) pushing those sheets of ice around, sloshing them west to east and back. The sheets start piling up on the beach, and in the very cold temperatures, quickly freeze into massive cliff of ice. Then, because only the surface has frozen, some liquid water seeps in, collapsing the weaker sheets of ice closer to shore, and stranding “icebergs” dozens of yards away from shoreline. 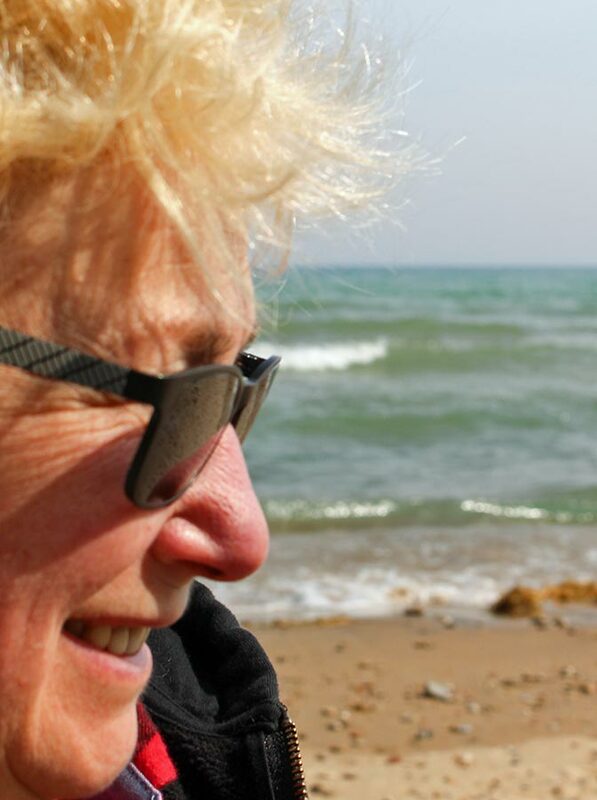 Elizabeth G Fagan is an artist and writer who resides in southeastern Wisconsin—a place she calls Lake Michigan’s Left Coast. Her art begins with her own photography. Then she alters her photos digitally to create images that can be printed in a variety of media: unframed prints or canvases; custom-framed prints or canvases; 5″×7″ or 8″×10″ wood panels; pillows, throws, calendars, greeting cards, coffee mugs, and more. Artwork dimensions given in inches. A surge of historically cold air continues to settle in. Wind Chills fell to between 45 and 55 degrees below zero this morning. Only a slight recovery is expected this afternoon. Frostbite can occur in as little as 5 minutes. Avoid going outside for any length of time.